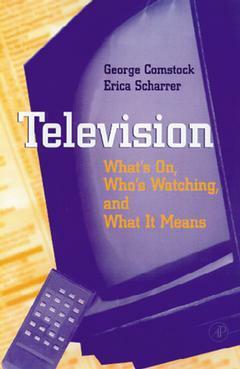 Television: What's On, Who's Watching, and What It Means presents a comprehensive examination of the role of television in one's life. The emphasis is on data collected over the past two decades pointing to an increasing and in some instances a surprising influence of the medium. Television is not only watched but its messages are attended to and well understood. There is no shame in spending hours in front of the set, in fact, people over-estimate the time they spend viewing. Television advertising no longer persuades--it sells by creating a burst of emotional liking for the commercial. The emphases of television news determine not only what voters think about but also the presidential candidate they expect to support on election day. Children and teenagers who watch a great deal of television perform poorly on standardized achievement tests, and among the reasons are the usurpation of time spent learning to read and the discouragement of book reading. Television violence frightens some children and excites others, but its foremost effect is to increase aggressive behavior that sometimes spills over into seriously harmful antisocial behavior. Three Eras. The Main Means. Assembled to Monitor. University researchers and scholars in social psychology, communication, child development, sociology, advertising, marketing, and political science; graduate and senior undergraduate courses in mass media and communications. Erica Scharrer is an Associate Professor in the Department of Communication at University of Massachusetts and studies media content, opinions about media, and media influence.